When scientists develop brand new materials, they must precisely determine the ingredients, quantities, and processing methods to use. It’s kind of like creating a recipe. Before spending time and money to test these recipes in a lab, scientists can first use computer simulations to see how the molecules in the ingredients will behave under changing conditions. However, as researchers invent increasingly innovative and complex materials, they need models and simulations that run for longer time scales, and offer resolutions at multiple length scales, than what is available. said Arthi Jayaraman, an associate professor in the Department of Chemical and Biomolecular Engineering and Department of Materials Science and Engineering at the University of Delaware. Jayaraman is building better models right here at UD. For this research, she along with collaborators Ryan Hayward of University of Massachusetts Amherst and Paul Butler of National Institutes of Standards and Technology have been awarded a $726,000 grant from the U.S. Department of Energy Office of Basic Energy Sciences. Jayaraman is developing computational methods to study polymer nanocomposites, materials that are made of polymers and nanoparticles, with hydrogen bonding chemistries. Polymers are materials that are ubiquitous in nature and in man-made products, from silk to tires to plastic bags. Many polymeric materials have chemistries that make hydrogen bonds. DNA – a polymer that is in every cell in your body—is one such example. Scientists who design such materials want to understand how these polymers behave at the molecular level, especially in response to temperature. When these substances are heated to a certain point, the “stickiness” of their hydrogen bonds is lost, leaving behind polymer segments or “chains” that are now free to move around and rearrange. The pace and path of their movement is not random—it’s like a choreographed dance. “I love thinking about how molecules interact with each other during this movement,” she said. With modeling, Jayaraman can see what temperature changes or other factors would be required to make molecules rearrange the way we want them to. This predictive capability of models allows researchers to tailor materials with specific, desired properties. 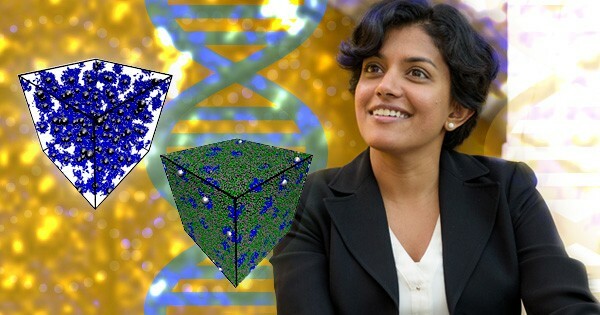 Jayaraman and her research team utilize UD’s Farber Cluster to simulate the materials with their new computational models. Then she shares these simulation results with her collaborators at the National Institute of Standards and Technology and the University of Massachusetts-Amherst. They then do the analogous experiments to verify the models. “The only way to know if the models work is to test them against results from experiments,” said Jayaraman. Once the models are verified, they will be important tools for use before experiments. “Computations then guide the experimentalists on what to try next,” said Jayaraman. The union of modeling and experimentation drives innovation forward. “We think that understanding, and ultimately controlling, how nanoparticle fillers interact with polymers through hydrogen bonds will open the door to polymer nanocomposites with precisely tuned structures and properties. We are very excited for the opportunity to work together with Arthi on the project, and to pair the theory and simulation methods that she has been at the forefront of developing closely with experimental characterization of these materials,” said Ryan Hayward, professor in the Department of Polymer Science & Engineering at the University of Massachusetts-Amherst.